If you missed yesterday’s review about what I was looking for on this vacation, Folly Beach in general, and the awesomeness of the Tides Folly Beach hotel, you can read it here. On our trip, we wanted a mix of the beach and downtown Charleston, SC. So we spent our days in Folly Beach and headed to downtown Charleston in the evenings to experience the nightlife. I’m a HUGE history nerd/buff, so I was really excited to poke around such a historical city! And let’s be honest–Gone with the Wind is one of my all-time favorite movies, and Rhett Butler’s People is one of my all-time favorite books! SWOON!!! Our time in Charleston focused mainly on the locales of King Street, Market Street, and Meeting Street. We had some yummy food and got to experience a Ghost and Dungeon’s Tour, and saw Battery Park. We tried to tour a plantation home, but missed the last tour of the day by 15 minutes. That’s okay though–that’s 1st on my to-do list when I head back down in September! Now that you have an overview, let’s talk specifics! 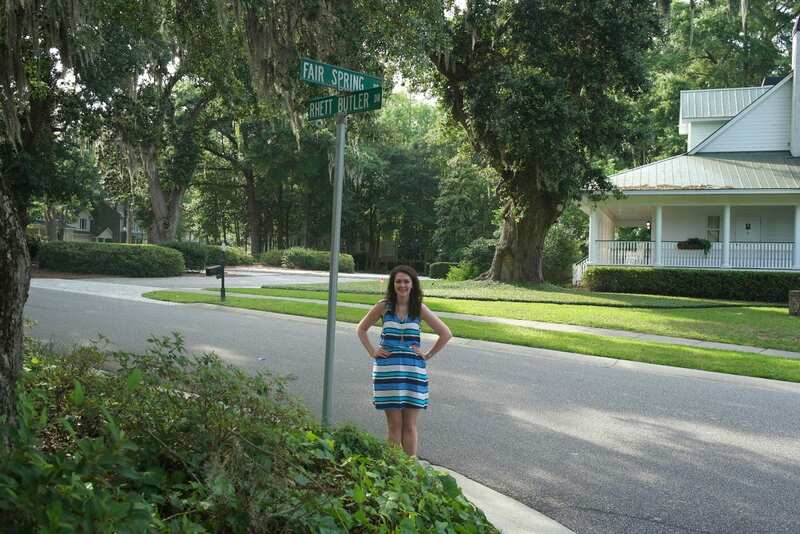 I found Rhett Butler Dr. so I had Chauncey take a picture! King Street– King Street is a one-way street that is lined by renovated buildings now serving as an eclectic mix of high-end shops, trendy boutiques, well-known chain stores, and eateries. 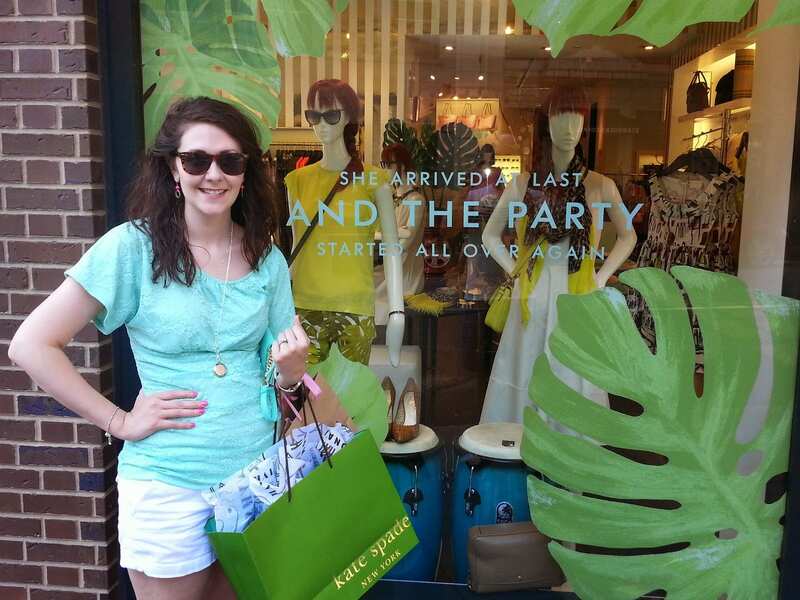 Some of the shops I ended up popping in and picking up stuff from were Handpicked, Kate Spade, Palm Avenue, and H&M. The beautiful Marion Square is across from the stately Francis Marion Hotel and is a nice green area downtown. Be aware, however, that most shops here close up early through the week. I think that many closed by 5 or 6 p.m., and only a few were open until 7 or 8 p.m.
Chauncey let me choose a new handbag from Kate Spade as an anniversary gift! I was nice and chose one from the sale. While visiting King’s Street, we ate at Jim ‘N Nick’s Community BBQ. Chauncey had a pulled pork sandwich and I had cheesefries. Great food! Market Street– Market Street is the home of Charleston City Market, an outdoor (but under a covered roof) market downtown, which is more arts & crafts oriented. You can read more about it here. Other shops and restaurants line the market. The Palmettoville locations and the Moon Pie General Store are two places to get some great souvenirs! Palmettoville had very budget-friendly t-shirts. This is also where the Bulldog Tours office is located. Meeting Street– Meeting Street is a history buff’s dream. It makes my historical heart go pitter-patter. There’s tons of restaurants, inns, and museum-type deals. There’s actually a section called Museum Mile, which you can read about here. This was along the route for the Ghost and Dungeon’s Tour. 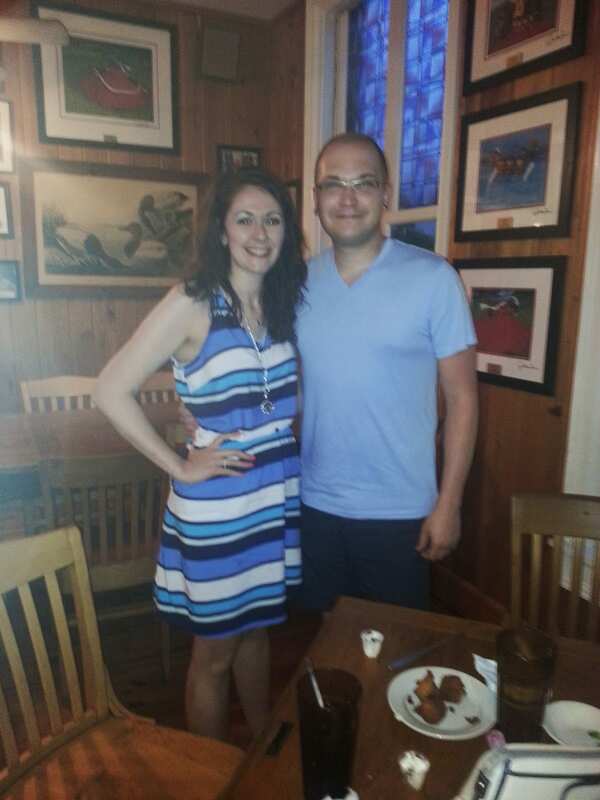 For our anniversary, we decided to go to Hyman’s Seafood after it was recommended to us by a friend who had visited the area, as well as a local. 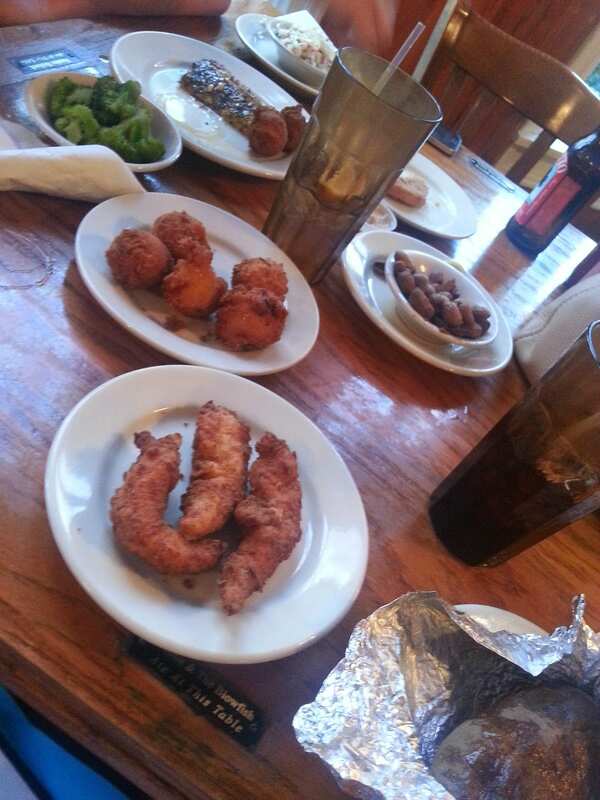 They offer hushpuppies while you’re waiting that have a bunch of different ingredients–beer, honey, sugar, and onions. That’s not really my kind of food, but Chauncey thought they were delicious. Chauncey had a mahi mahi dish. I, on the other hand, hate seafood so I had the chicken strips with a baked potato. We both enjoyed our meal. Interestingly enough, if you’ve been fishing that day, you can bring in your catch and they will prepare it for you, complete with sides, for $12! Evidently, a lot of celebrities visit Hyman’s. They have autographed material covering their walls, and each table has little signs engraved telling you who has eaten at that table. Vanilla Ice, the Beach Boys, and Hootie & the Blowfish all ate at ours. Ice, ice, baby! 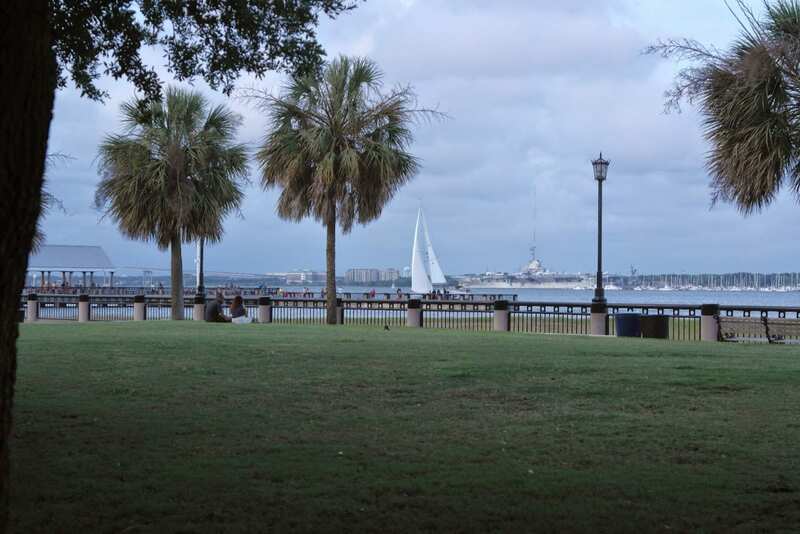 Battery Park- This is a beautiful area down by the Ashley River! Gorgeous views. It’s officially known as the White Point Gardens. 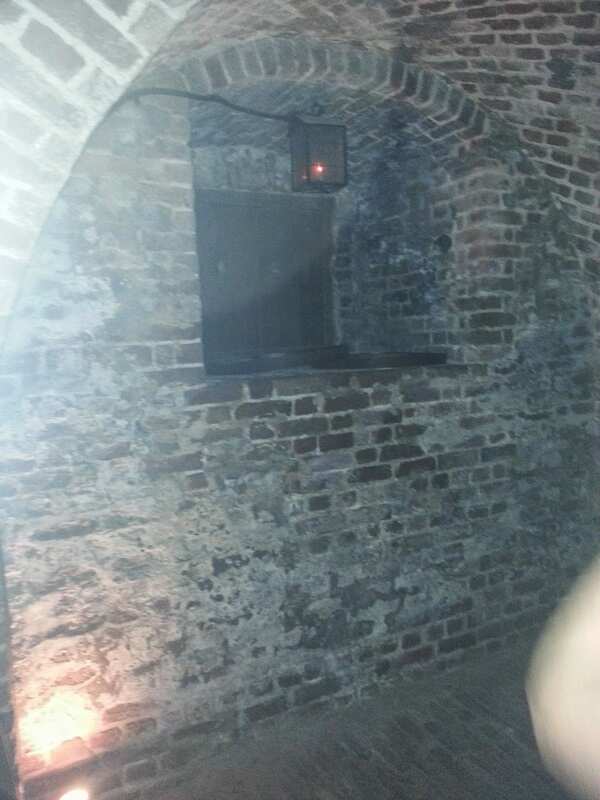 We visited this area on the Ghost and Dungeon’s Tour as well! I am a huge scaredy-cat, but Chauncey talked me into going on a ghost tour! We selected Bulldog Tours. Their website touts that they’ve been voted as Charleston’s Best Tour Company 5 years in a row! 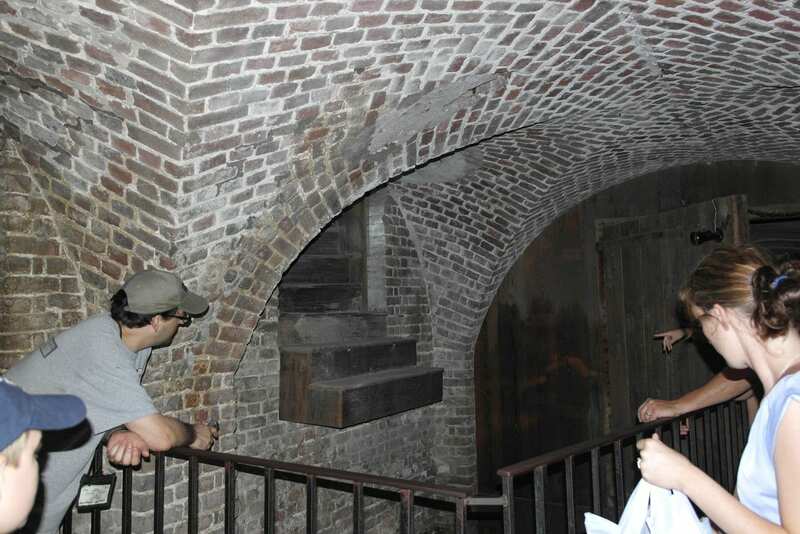 While they offer several different tours, we selected the Ghost & Dungeons Tour because it sounded interesting. 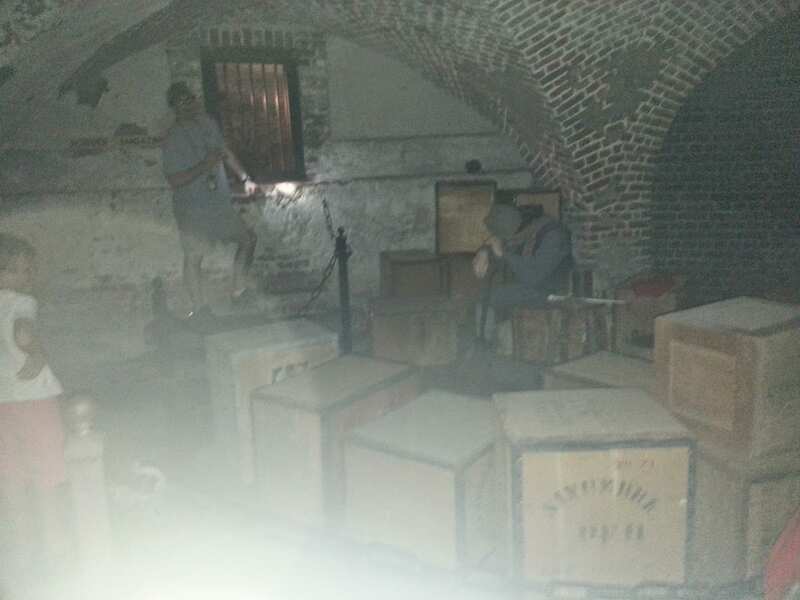 We learned on the tour that the Dungeon was where the political prisoners were kept, and it has a very interesting (if spooky history). 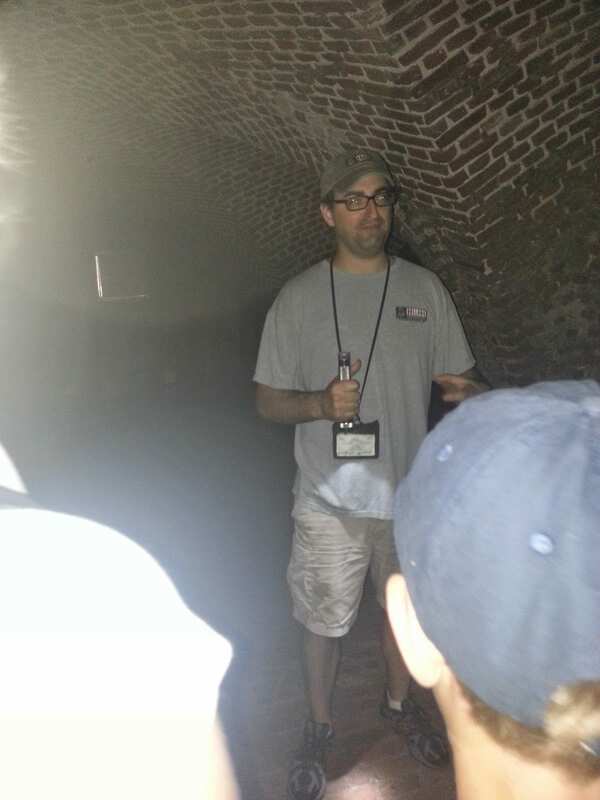 The tour was a 90-minute walking tour, and I highly recommend our tour guide, Braxton. He was very conversational and made the tour interesting and fun! 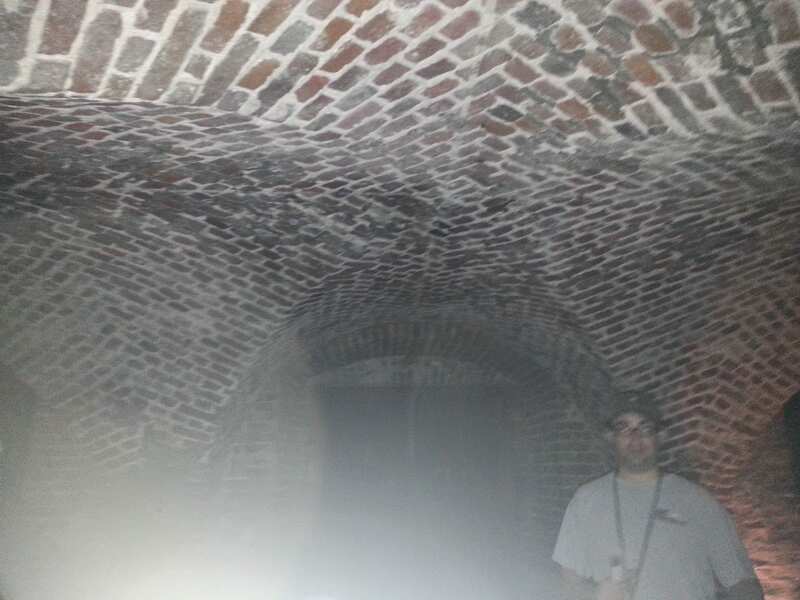 In the dungeon BEFORE my real camera stopped working. I won’t go into more detail because I don’t want to run the tour, but my actual camera stopped working while we were in the dungeon. Braxton will tell you that’s no surprise. I was able to continue taking pictures with my phone, but almost every single picture has a huge orb in varying locations on the left side of the picture. For those of you up n ghost hunting, you know what that means. . . . There are animatronic people in the Dungeon, because it’s open for tours during the day, and they’re a part of those tours. If you’re interested in taking a tour, ghostly or not, check out Bulldog Tour’s website and click here for a $2 off coupon that good for all adult’s in your party! I was most looking forward to visiting a plantation. Sadly, we missed the last tour at the plantation we planned on visiting by 15 minutes due to heavy traffic. Of note, however, is that Drayton Hall is kept in “near-original condition” and Boone Hall Plantation is where parts of the Notebook were filmed. Definitely visiting on my next trip! 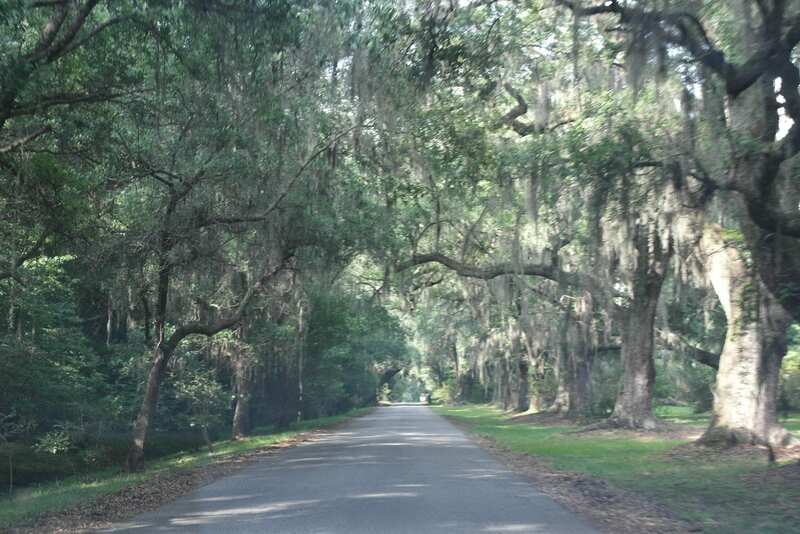 Long, stately, winding drive leading to Magnolia Plantation. We got that far at least! I’m so glad we decided to visit the Charleston, SC area! We had an awesome time, and there’s so much to do and explore that I don’t think you can ever be bored. Whether you’re a casual tourist, history buff, dedicated shopper, or beach bum, there’s something for everyone in the area! 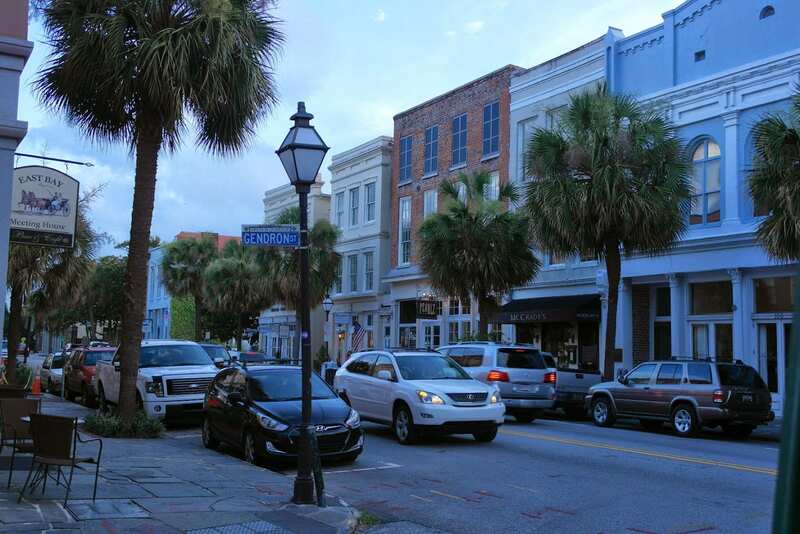 Have you been to downtown Charleston, or live near the area? What places would YOU recommend to a tourist? Boone Hall Plantation is my absolute favorite place in the world; it's gorgeous. The Civil War miniseries "North and South" starring Patrick Swayze also was filmed there. We went to Charleston last year, and loved it! I especially loved just wandering up and down the streets, enjoying the architecture. When do we get to see that anniversary bag??? 🙂 Love the blog redesign! I didn't know that! I would like to visit there and Drayton Hall! Any suggestions for hotels/inns in downtown Charleston? Katie, did you all stay in Charleston or at the beach? If you stayed downtown, would you recommend where you stayed? 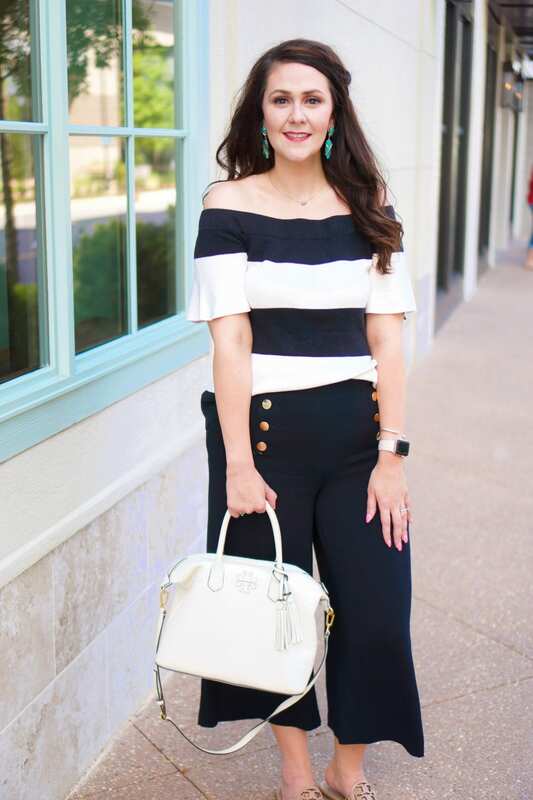 The bag is on instagram–I'll tag you in the comments. And thanks! I'm really pleased with how it turned out! Yes! It was Patrick Swayze's family home "Mount Royal" in the miniseries. I absolutely adore Boone Hall, if you do get the chance to visit, take it! Unfortunately I don't have any suggestions for staying in Charleston. Normally when we visit Charleston, we're vacationing in Myrtle Beach (which I do have a great suggestion for there! You can check it out on my blog, I posted about it earlier in the month) or in Oak Island, North Carolina. Oak Island is roughly 45 minutes north of Myrtle Beach and 45 minutes south of Wilimington, so it's a great location if you like to explore other places. 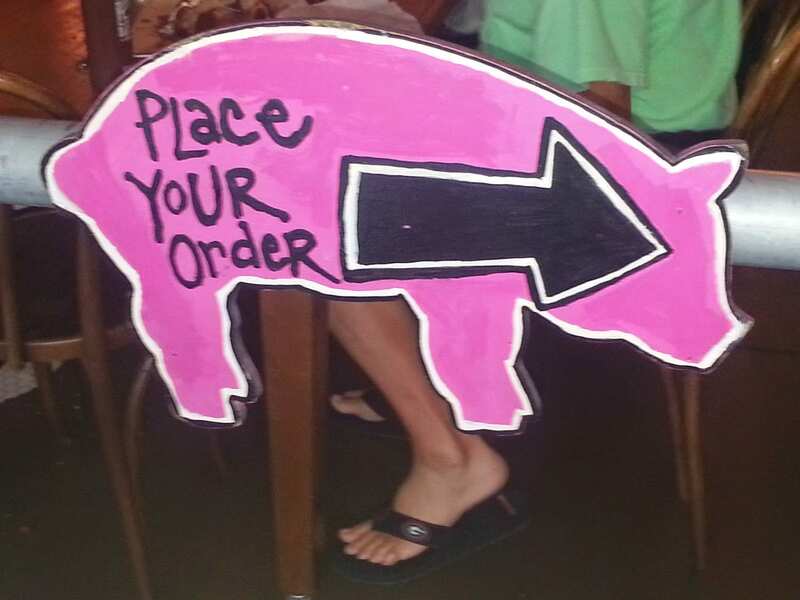 It's very family oriented and not very crowded, plus it's also near Bald Head Island and Southport, so you can easily visit those locations too. When visiting the Charleston area, we also like to visit Brookgreen Gardens (website is http://www.brookgreen.org/); it's a wildlife preserve and sculpture garden. It's gorgeous too!